Frida Kahlo, one of the most influential Mexican painters of the middle 20th century. With delicious sangria and gourmet Mexican snacks served by Betsy Mullins, we stood, as the room was packed, and listened to stupendous lecturer Armando Droulers talk about Frida’s life of love, passion and pain, we couldn’t take our eyes, or ears, off of him. Frida’s work is incredible, her paintings are mostly self-portraits, and as she puts it: “I never painted dreams. I painted my own reality”. One very notable characteristic of Frida is the way she looked, groomed and dressed. Never wanting to remove her facial hair and accentuating her eyebrows in her paintings, she’s known for her folkloric Mexican Tehuana costume, her hair grooming and her original jewelry, all which have served as inspiration to many designers along time. Coldplay confirmed that their album was named ‘Viva la Vida’, after the inscription meaning long live life that frontman Chris Martin saw on a Frida Kahlo painting. 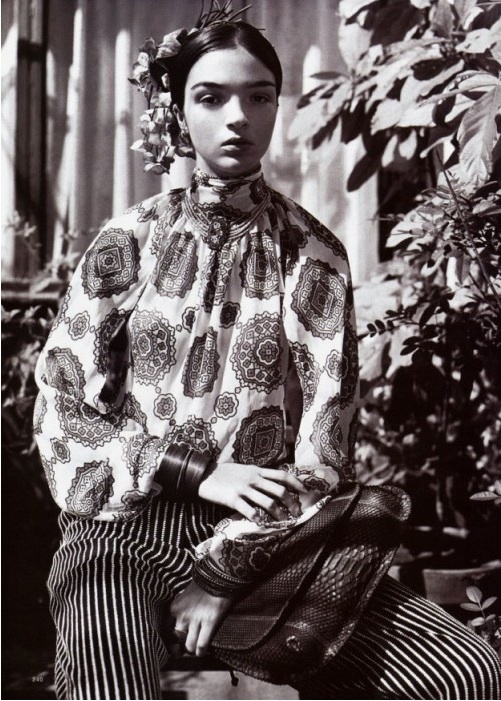 Photo of model Maria Carla in “Frida Kahlo” for Harper’s Bazaar November 2001, by photographer Nathaniel Goldberg. ← Nicolas Felizola – Exquisite!